Lets us understand some facts from psoriasis pictures which will help us to know from which type of psoriasis Rina is suffering with. The most common areas affected in Psoriasis are the scalp, elbows, knees, and lower back, although any skin surface may be involved. It can also occur in the nails and body folds. Presentation of psoriasis can appear different in different people as form, location involved, intensity, extent, duration of disease varies from person to person. Psoriasis patches can range from few spots of dandruff like scaling to major eruptions that covers large areas. Though various types of psoriasis look different they are typically identified by their hallmark appearance. What is plaque in psoriasis? 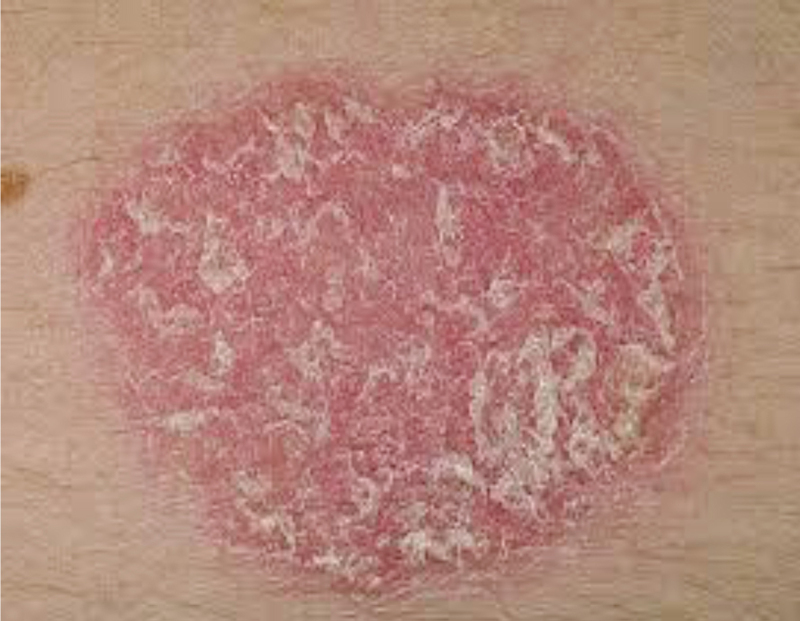 In psoriasis the inflammation of the skin leads to appearance of red eruptions on the surface. These eruptions become thickened and form a plaque. In psoriasis plaques are covered with silver or white layer of scales are nothing but due to excessive shedding of the upper layer of skin. How different types psoriasis looks like? Plaque psoriasis is the most common form of psoriasis, affecting 80 percent of people with psoriasis. It often appears on the elbows, knees, lower back, and scalp. It is characterized by dry, thick, red patches on skin known as plaque, often with a silver or white layer of scale.They are often itchy and painful, and they can crack and bleed. 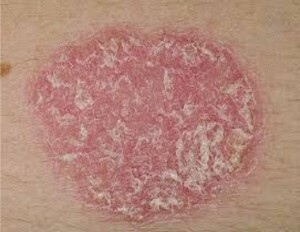 Guttate psoriasis appears in small red spots on the skin. It is the second most common form of psoriasis. The spots often appear on the torso and limbs, but they can also occur on the face and scalp. They are usually not as thick as plaque psoriasis, but they may develop into plaque psoriasis over time. Flexural or inverse psoriasis often appears in skin folds (under the breasts, in the armpits, or in the groin area). It is very red and often shiny and smooth. Most people with inverse psoriasis also have a different form of psoriasis in other places on the body. The sweat and moisture from skin folds keeps this form of psoriasis from shedding skin scales, and the skin-on-skin contact can make inverse psoriasis very irritating. Pustular psoriasis is characterized by white pus filled eruptions surrounded by red skin. Scaling also occurs. Pustular psoriasis may affect isolated areas of the body, like the hands and feet, or cover most of the skin’s surface. Some people experience cyclic periods of pustules and remission. This form of psoriasis looks like severe burns to the skin. It may cover large portions of the body, and old cells get removed in larger pieces than the small scales. It may cause severe dandruff or flakes and itching. It can be noticeable at the hairline. It can extend to the neck, face, and ears. In some cases, scalp psoriasis make regular hair hygiene difficult. Excessive scratching can cause hair loss and scalp infections, and the condition can be a source of social stress. Scalp psoriasis can be very mild, with slight, fine scaling. It can also be very severe with thick, crusted plaques covering the entire scalp. Nail psoriasis can cause nail pitting, grooves, discoloration, loosening or crumbling of the nail, thickened skin under the nail, and colored patches or spots under the nail. Palmo-plantar psoriasis is characterized by appearance of red patches of skin topped with scales typical of psoriasis on the palms and soles.There is thickening and scaling of the skin accompanied with the formation of deep, painful fissures on the palms and soles. As psoriasis is a disease of remission and relapses the treatment is bit difficult. There are many ways and method to treat psoriasis. Many methods produce results, which may last for varying periods. What homeopathy can offer in Psoriasis? Psoriasis is a disease on the skin, and it is not a disease of the skin. That means, that psoriasis is a disease of internal, immunological system, which manifests on the skin. The topical treatment is going to be short lasting and superficial. Homeopathic treatment for psoriasis aims at addressing the immunological factors responsible for its development and hence treats the root cause. The frequent relapses of can be control and hence the person can live with long period of remission.